Spuyten Duyvil No. 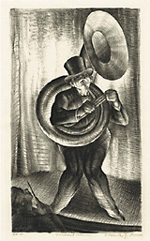 1 - - 1930, Lithograph. Edition 50. Signed, titled and annotated ed- 50 in pencil. Signed and dated in the stone, lower left. Image size 9 7/8 x 13 7/8 inches (251 x 352 mm); sheet size 13 1/2 x 17 7/8 inches (343 x 454 mm). A fine, rich impression, with full margins (1 x 2 1/2 inches), on cream wove paper, in excellent condition. 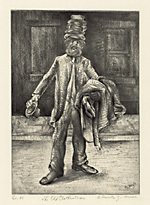 Long Island Peasant - - c. 1935, Etching and Aquatint. 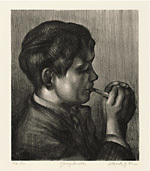 Edition 75. Signed, titled, and annotated ed- 75 in pencil. Signed in the plate, lower left. Image size 7 7/8 x 10 15/16 inches (200 x 279 mm); sheet size 10 5/8 x 14 1/2 inches (270 x 368 mm). 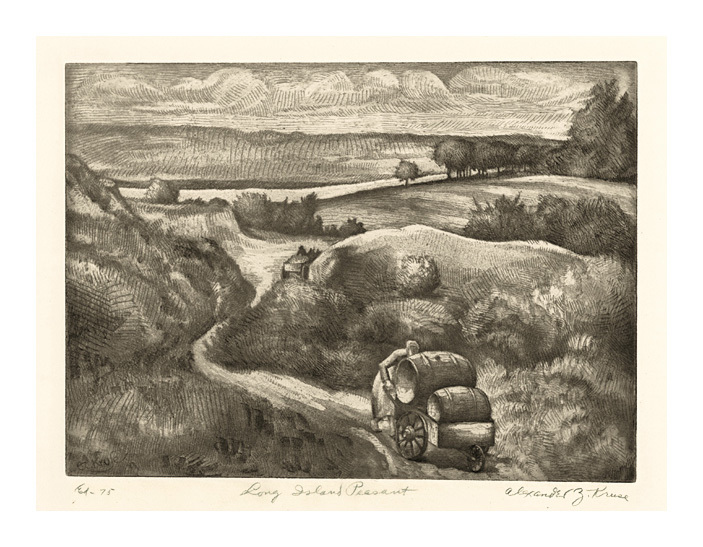 A fine, rich impression, with full margins (1 3/8 x 1 3/4 inches), on cream wove paper, in excellent condition. 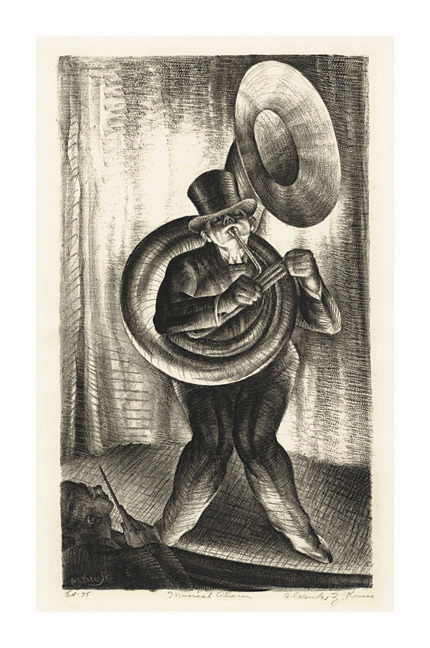 Musical Clown - - c. 1935, Lithograph. Edition 75. Signed, titled and annotated ed- 75 in pencil. Signed in the stone, lower left. 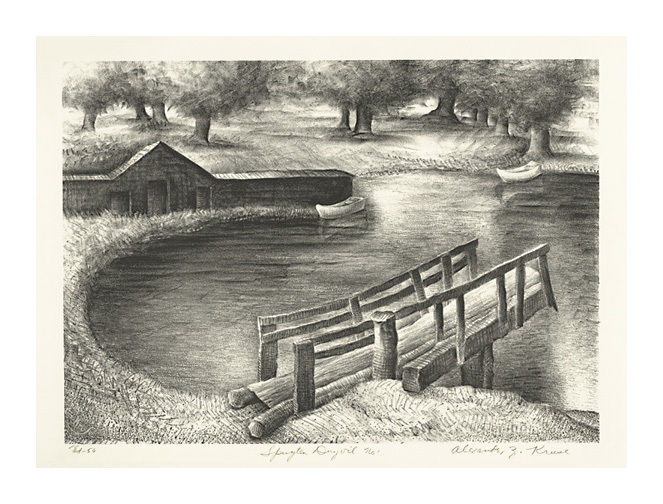 Image size 14 1/2 x 8 3/8 inches (368 x 213 mm); sheet size 15 7/8 x 11 1/4 inches (403 x 286 mm). A fine, rich impression, with full margins (1 x 3 inches), on cream wove paper, in excellent condition. 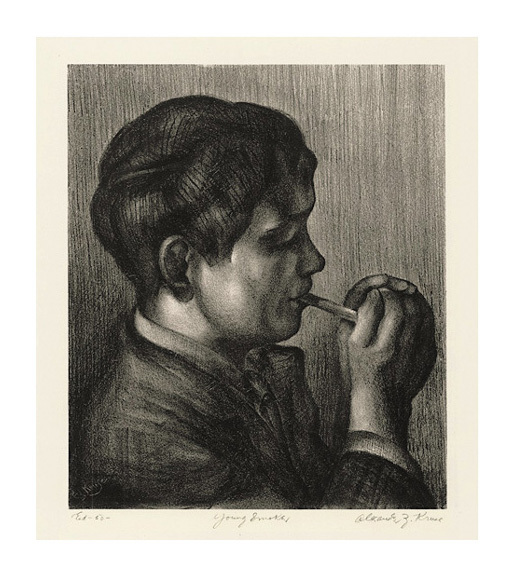 Young Smoker - - c. 1935, Lithograph. Edition 50. Signed, titled and annotated ed- 50 in pencil. Signed in the stone, lower left. Image size 10 15/16 x 9 1/8 inches (278 x 232 mm); sheet size 16 x 11 1/4 inches (406 x 286 mm). 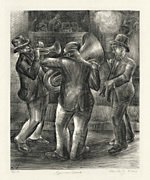 German Band - - c. 1935, Lithograph. Image size 12 5/8 x 10 3/8 inches (321 x 264 mm); sheet size 18 1/2 x 13 1/2 inches (470 x 343 mm). A fine, rich impression, with full margins (1 3/8 x 3 inches), on cream wove paper, in excellent condition. 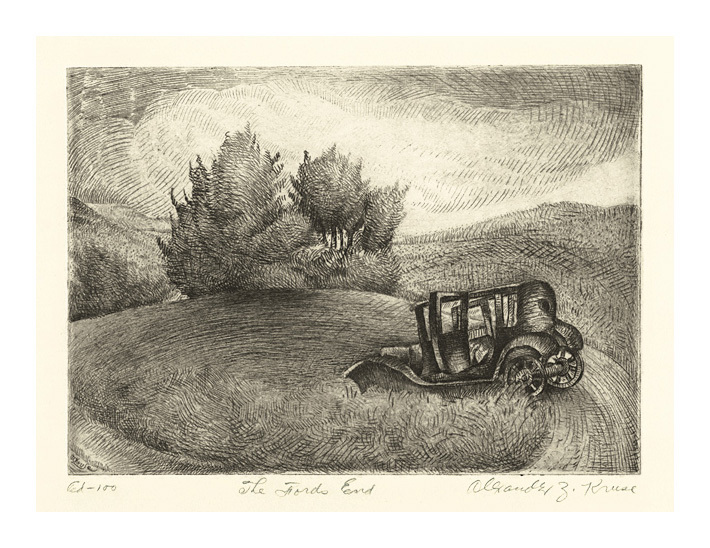 The Ford's End - - c. 1935, Etching. Edition 100. Signed, titled and annotated ed- 100 in pencil. Signed in the plate, lower left. 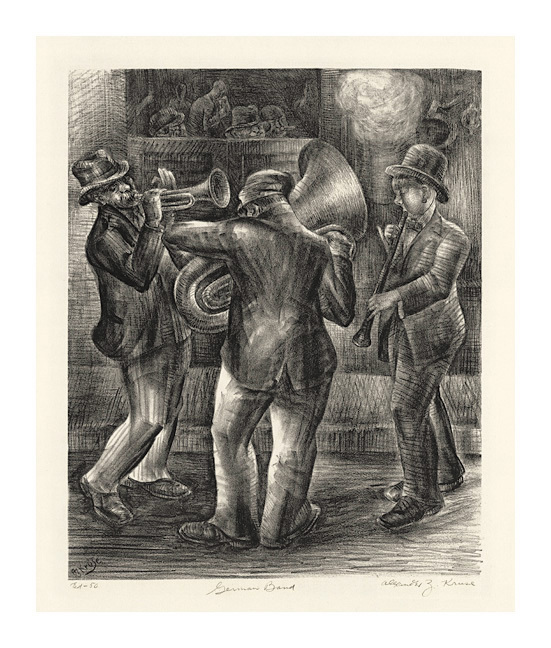 Image size 5 15/16 x 8 3/8 inches (151 x 213 mm); sheet size 9 3/4 x 11 1/8 inches (248 x 283 mm). 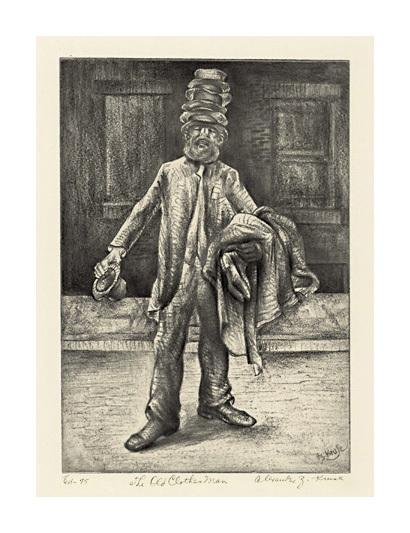 The Old Clothes Man - - c. 1935, Soft-Ground Etching and Roulette. Image size 10 1/8 x 7 inches (257 x 179 mm); sheet size 13 3/8 x 10 5/8 inches (340 x 270 mm).